Coffeeplease ecological darkroast ground filter coffee s a dark roasted coffee with a little more power whole box with 6 kilos of coffee. The coffee is made from ecological and KRAV-certified arabica beans, which have been grown at 1200-1700 meters altitude. The taste is rich and creamy, soft and lean with hints of citrus, apple, honey and chocolate. 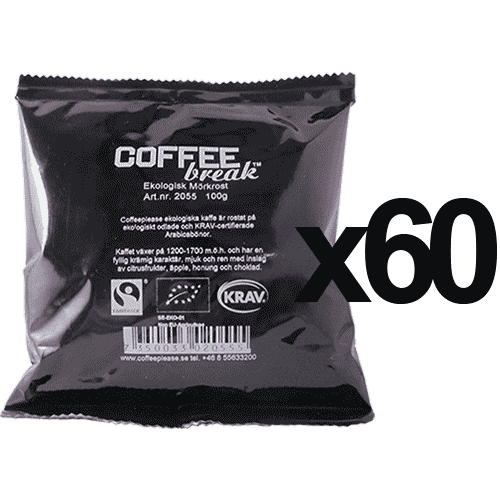 We can now offer this coffee in practical 100 gram bag. Never again let your coffee become old in the bag. This is good for two brewings with 6-7 cups or if you have a large brewer (ex. Coffee Queen or Bunn) fill the whole kettle and use the whole bag.